When Perry is visited by Diana Reynolds, a pretty blonde displaying a black eye and wearing an overcoat covering a bathrobe, the lawyer suspects he�s in for an unusual case. CARS: light color 1948 Oldsmobile 66 Special Club Coupe; 1956 Chevrolet 150 4dr Sedan Taxi; 1958 Pontiac Bonneville convertible, white, white top up; 1958 Cadillac convertible, black, all-white interior, top down (Mason). Cameos: 1958 Ford 4dr wagon, 2-tone: dark & medium colors; 1955 Chevrolet Nomad, dark color w/ white top. From The Cars by Greg Cockerill. Location: It seems to me that the house seen near the beginning is the same house seen in #62, TCOT Howling Dog. Submitted by Charles Richmond, 10/23/07. Posted by daveb. Some pictures here. + The house that Charles Richmond has pictured from #37, TCOT Black-eyed Blonde, is the same house used in #5, TCOT Sulky Girl. You can see the tree that Judge Purley parks by on the circle driveway, and you can see the windows that Graves looked through. Submitted by PaulDrake 33, 06/17/08. Pictures from both episodes here. 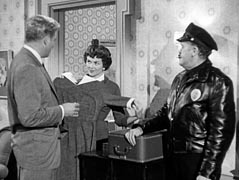 This is the first of three appearances on Perry by Phyllis Coates, playing Norma Carter. 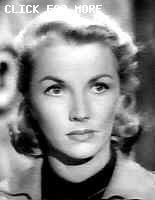 I know all baby boomers remember Phyllis Coates as the original television Lois Lane in the initial season of Superman (1952-1953). Phyllis, whose birth name was Gypsie, is yet living at the age of 82 and in 2008 appeared at a nostalgia event. Submitted by PaulDrake 33, 6/25/2009. Sightings: In the back of the courtroom gallery is a Pencil Mustache Man who likes to call attention to himself by fidgeting and pretend-whispering. Behind Mason is Sasha Magaloff and his distinctive ears. On the second day of the hearing, we see the Little Old Lady #1 (and Sasha returns) . Read more about these and other spectators here. Submitted by gracep, 9/27/2010. + Next to Sasha is Little Old Lady #2, who on the second day sits behind him. Way in the back row is Distinguished Lady #4. Submitted by gracenote, 10/18/2011. ++ As court adjourns, we see the Distinguished Gentleman #2. Submitted by BigBill767, 12/9/16. Uncredited Actors: Burr�s stand-in, Lee Miller, makes one of many appearances as the unobtrusive but dutiful Sgt. Brice. Submitted by gracep, 9/27/2010. + Don Anderson makes a very unusual appearance in this episode. He plays Robert Bartlett, late son of Matthew Bartlett (R. G. Armstrong) and supposed father of Bobby Carter. Since at the time of the story his character has been dead for four years, Anderson (wearing an Army uniform) appears only in a photograph in his widow�s (Phyllis Coates�) living room. Submitted by FredK, 6 October 2010. Goof: This is one of many episodes in which Lt. Tragg (or his successors) arrest Perry�s client in the office. In this case, Tragg and Sgt. Brice enter and Tragg announces that he has a warrant for the arrest of Diana Reynolds (Whitney Blake). However, the piece of paper he holds in his hand is clearly marked as a subpoena not a warrant. Submitted by FredK, 6 October 2010. Error & Note: Perry asks Diana (Whitney Blake) if she has a tailored suit which she assures Perry she has, and he then sends Della and Paul to her apartment, as pictured above on this page, to find one he thinks will be suitable in court. In the next scene however Diana is seen wearing a turtleneck long sleeved blouse with a vest. Hardly a tailored suit. Asking Diana if she had "a tailored suit", and then saying that the blue one selected by the matron was unacceptable, was merely a ruse used by Mr. Mason to gain access to her apartment and have the opportunity to search for her roommate's diary. jfh 29Aug2016. + As with Episode One, she's also accused - falsely, we assume - of having stolen jewelry...tho at least she isn't tried for it here. Notcom 091917. One of the few times we see a death bed confession by the murderer. Submitted by PaulDrake33, 6/26/2008. The scene with the murderess attempting to flee in the jeep is odd. The back of the jeep is covered with what appears to be a blanket so we can�t see what�s behind the jeep. If the jeep were moving, I�m afraid this blanket would be blowing all over the place, but it doesn�t. My only explanation for this rather odd device is that there was some reason they couldn�t do rear-screen projection. Submitted by billp, 29 October 2009. + Upon further viewing, it appears that the blanket is attached to back of a square frame not only at the top, but at the sides as well when we see it leave the farm as the police gives chase. This would account for it not flapping around in the wind, but its purpose is rather mysterious save for the obvious explaination that they didn�t shoot a �plate� for the background, saving a bit of time and money. Submitted by Kenmore, 11/2/2011. Although this episode has a feel-good ending, it seems to me that Matthew Bartlett deserved to know the truth about Bobby. Submitted by 65tosspowertrap, 4-28-2014. Feel good, true, but I think that there would be no way even then to keep the truth about Bobby from Matthew Bartlett. The law would have insisted on it. Submitted by MikeReese, 8/16/2014.